It is simply not possible to fully communicate the feeling and amount of detail embedded in a true photographic print when an image is simply viewed over the internet. Much information is lost by viewing on a computer monitor. I shoot with medium format cameras which produce negatives that are many times larger than a 35mm piece of film. My 6x6cm medium format camera, for example, produces a negative that is about five times larger than 35mm film, which in turn produces much more detail. 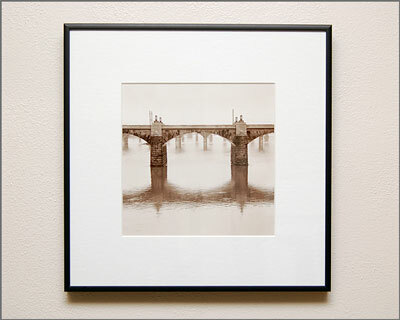 "Bridges over the Susquehanna," 7x7" silver gelatin print. My black and white photographs are hand printed traditionally by myself. Each print is carefully exposed from the original negative. Any corrections, such as dodging and burning are done for each and every print. Since each and every print is created by myself, these prints are very unique. Final prints are toned with one or any combination of selenium, sepia, and brown toners. All prints are on fiber base papers and archivally processed to last well over a hundred years. Prints available for select photos. Prints are available unframed, matted or matted and framed. Matted prints will be mounted and matted with archival acid free matting to fit a standard size frame (8x10, 11x14, or 16x20). This is the best option when the buyer wishes to purchase a frame based on what they would like. Framed prints are matted in white acid free matting and framed with a simple black molding.